Kyulux develops materials for OLED display and lighting panels, with a focus on TADF and Hyperfluorescence emitter and host materials. The emissive layer of an OLED, comprised of an emitter and a host, is the heart of the OLED panel, where the electric charge is converted into light. The original fluorescence OLED emitters converted only 25% of the electricity into light. 2nd-Gen phosphorescent emitters achieve an IQE of 100%, but require doping by heavy metals – which limits the molecule design freedom (and also, a blue phosphorescent emitter has yet to be developed). TADF (Thermally Activated Delayed Fluorescence) emitters, first developed in 2012, achieve 100% IQE without any rare metals, and are so believed to be the future of OLEDs. TADF emitters were invented by Dr. Chihaya Adachi and his research group in Kyushu University. Kyulux develops hyperfluorescence OLEDs, which combine TADF and fluorescence emitters to enable highly efficient emission (100% IQE), low cost and high color purity. Hyperfluorescence was invented at Kyushu University by Dr. Chihaya Adachi and the technology is exclusively licensed to Kyulux. Kyulux’s first aim is to develop commercial red, green and yellow hyperfluorescence emitter/host combinations, to replace the 2nd-Gen phosphorescent emitters currently used in OLED displays and lighting panels. The drive towards high color gamut displays requires emitters with narrow spectrum. 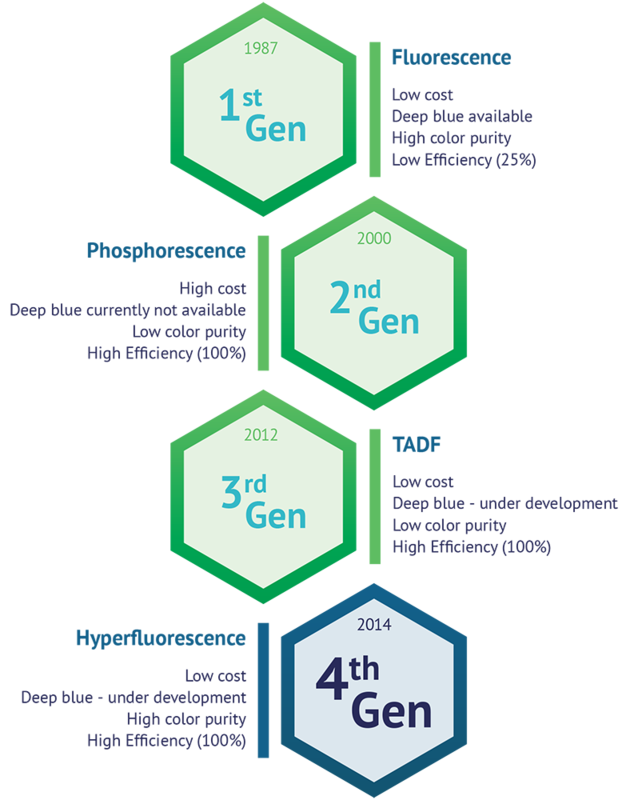 While 1st-gen fluorescence emitters do feature such a narrow spectrum, they severely lack in efficiency. The currently widespread high-efficiency 2nd-gen heavy-metal based phosphorescence emitters suffer from a wide spectrum and high costs. For the first time ever, Hyperfluorescence emitters manage to bring together high efficiency and a narrow spectrum and are thus poised to become the ultimate emitter system.